The team accepts their cheque from Scotmid. "I’d like to say a big thank you to Scotmid for supporting the team. We are really delighted to accept this grant and it means a great deal to the boys." 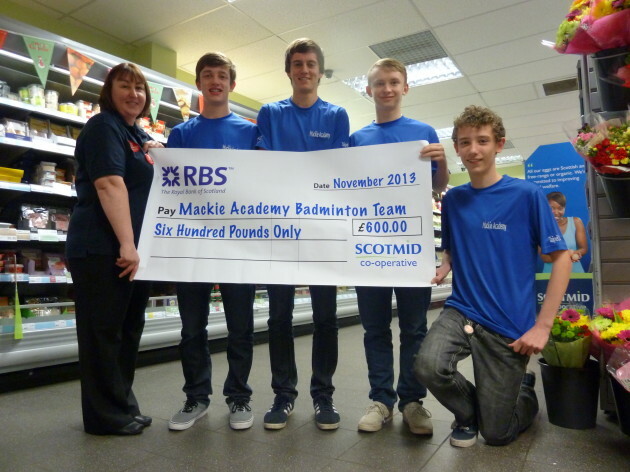 Mackie Academy Badminton team has become the lucky recipient of a £600 community grant from Scotmid Co-operative. The team will be heading to Chinese Taipei in May 2014 to compete in the International School Sports Federation World Games and the grant awarded by Scotmid’s North Regional Committee, is to assist with the purchase of kit and bags for the team. The team consisting of Mark Leith S5, Jacob Reynolds S6, Matthew Duguid S4 and Sam Muir S3 was selected to represent Scotland in the World Games following their win of the Scottish schools badminton tournament in Ravenscraig last year. With nine national junior titles between the boys and an international title for Mark, the Mackie Academy team is set to do well in the competition which will see them battle it out on the court against teams from all over the world including Armenia, Brazil and China itself.